Are you going out to the mound too early, or wondering what to say when you get there? Discover 4 keys for your next trip to the mound. Learn how to maximize your pitching circle visits and help your pitchers get back on track. Mound visits are never easy, since you’re not out there to tell her how great she’s doing. By the time you call “time” and walk out there, things have started sliding down hill. Or at the very least, starting to slip that way. Avoid Going Out Early – We often take our first trip to the mound too early. We’ll take it at the first sign of trouble, and mostly because we’re getting nervous or frustrated, and not because our pitcher really needs to hear from us. Then, later in that same inning, when our pitcher really does need us, and when we really do have something valuable to say to her, we can’t make the trip without taking her out of the game. Sure, we can tell our catcher to go talk to her, but is that the same? The next time your pitcher starts to struggle, avoid going out to the mound. Shoot her a smile of encouragement and let her work through it. Send your catcher out to help her calm down, and then save your visit for when you really need it! Besides, if you take a trip to the circle at the first sign of trouble, it tells your offense you don’t have confidence in them and makes your pitcher a nervous wreck. 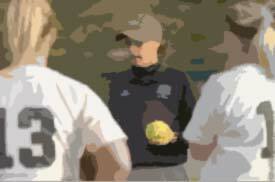 Walk Out with the Catcher – Instead of walking straight to the mound to talk with your pitcher, meet the catcher and walk to the circle with her. The catcher will tell you honestly how well the pitches are moving, what the umpires zone is like, and how much longer this pitcher should go – and all without the emotional attachment of the pitcher. No offense pitchers, but you’re too emotionally attached to your performance to be objective. Most pitchers think they’re doing great – the ump just isn’t giving them anything, while the catcher will be far less emotionally attached and far more specific in her input. Most pitchers believe they can still get the next hitter out, even though they’ve walked the last 5 people. Ask the catcher, as you walk to the mound, and she’ll tell you the real deal. Deliver a Plan or Solution – Forget the obvious, she knows that. Tell her how to correct an issue she’s having, give her a plan for pitching to the next hitter or hitters, or help her calm down. Solutions are what players need from coaches, so give solutions, a plan or reassurance. Avoid asking “how do you feel?”. Not only is that vague, but if they felt great you wouldn’t be out there. Instead, tell her the plan or solution. For instance, does she need to slow down in between pitches, remember to breathe, keep her posture during the release, or is there something specific about how to pitch to the upcoming hitter? Whatever your purpose, make sure it leaves the pitcher with a plan or solution and at all costs, avoid stating the obvious, like “you’ve got to throw strikes”, “everything looks high” or “you look off today”. Trust me, she knows. Talk the Way They Respond – Some pitchers need to be challenged, others need to be encouraged, while others simply want to be told what to do. It’s important that you deliver your message in the way that the pitcher you’re talking to right now needs to hear it. Not sure how they need you to be, then ask them. Have each pitcher actually script out your visit. Have them tell you what they like you to say and how they want you to say it. All your pitchers are different, so your approach in the circle should be different with each one. Mix up the approaches and things will quickly go from bad to worse.